St. Joseph’s College former students have taken the top prize at the School Of Origin Golf tournament. Spearheaded by the Marist Brothers Old Pupil’s Association and Very Manaia Golf School, Saturday’s golf tournament was the stand out success with golfers turning out for an event with a good cause. At the prize giving, President of the M.B.O.P.A., Tuatagaloa Aumua Leung Wai, thanked the participants for their support. The Club acknowledged lead sponsors S.S.A.B. Apia Samoa who provided prizes worth over $7,000. The formalities closed with a few words by M.S.J.S.C. President, Faimalo Mathew Lemisio who thanked players and teams for supporting the vision of the club, in providing a platform to celebrate and showcase the sporting talent of Samoa. “What a fitting way to close our sports week, with the two associations – M.B.O.P.A. and M.S.J.S.C. 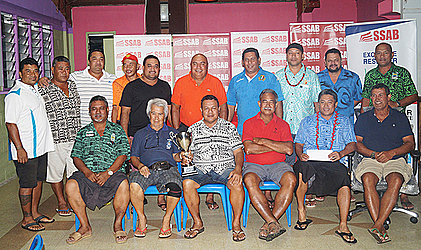 standing side by side, for an important cause: to continue to empower and inspire athletes, officials and administrators working across the sports sector in Samoa,” the Club said.